Self-pity is a prison cell. Recently a woman emailed to tell me I was a "fraud" and my devotion “Open Wide Your Mouth” was a lie. In rude, angry, bitter words she listed her problems, insisting God doesn't answer prayer. I wrote back, told her I was sorry about her difficulties, assured her God wanted to help, and told her I’d pray for her. I also told her she’d need to give up her anger and bitterness to make room for God's salvation and comfort. When she replied with angry profanity, I realized she was quite committed to staying in her prison cell of self-pity. At times, I’ve chosen that cell myself. But it’s not mistreatment or difficulty that puts us there. 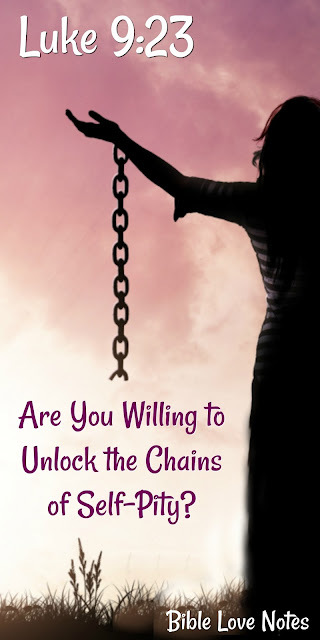 Cells of self-pity are locked from the inside. The key is always available and bears this inscription: "Whoever wants to be my disciple must deny themselves and take up their cross daily and follow me" (Luke 9:23). Self-pity is self-imprisonment. Let's not go there! 1. Selfishness is any act or attitude that focuses on our feelings and desires above the feelings and desires of others. Philippians 2:3-4: Do nothing out of selfish ambition or vain conceit. Rather, in humility value others above yourselves, 4 not looking to your own interests but each of you to the interests of the others. Proverbs 11:25: A generous person will prosper; whoever refreshes others will be refreshed. 2. When we wallow in self-pity, we grow an eye log. We become insensitive to the feelings and desires of others but overly sensitive to our own feelings and desires. Matthew 7:1-4:“Do not judge others, and you will not be judged. 2 For you will be treated as you treat others. The standard you use in judging is the standard by which you will be judged. 3 “And why worry about a speck in your friend’s eye when you have a log in your own? 4 How can you think of saying to your friend, ‘Let me help you get rid of that speck in your eye,’ when you can’t see past the log in your own eye? 3. Self-pity is a self-inflicted wound. It never solves a single problem. But it causes a great many. Hebrews 12:15: Look after each other so that none of you fails to receive the grace of God. Watch out that no poisonous root of bitterness grows up to trouble you, corrupting many. Ephesians 4:26-27: And “don’t sin by letting anger control you.” Don’t let the sun go down while you are still angry, 27 for anger gives a foothold to the devil. The Greek for "foothold" means to give the devil a place or an opportunity. It's like preparing a room in our hearts for Satan to dwell and keep us constant company, reminding us of how we've been wronged and helping us forget our blessings. 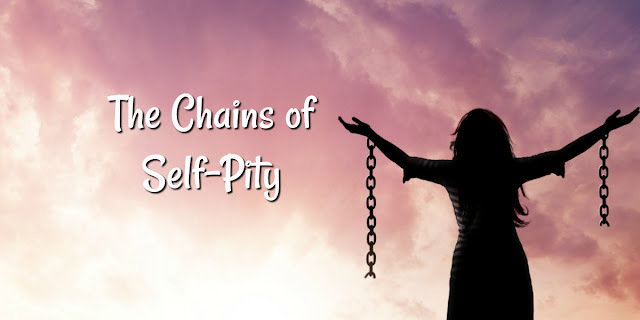 Anger, bitterness and self-pity are intertwined. Any and all of them will give Satan a foothold in our lives. When we're going through a difficult period, we should pray throughout the day and make sure we don't go to bed brooding or angry.